Falls are the primary cause of injury and accidental death for Canadians over the age of 65, and are also responsible for about 85 per cent of accident-related hospitalizations for seniors, according to the Public Health Agency of Canada. Anywhere from 20 to 30 percent of seniors fall at least once in a year, and most falls resulting in hospitalization happen at home. Although falls can and do happen to anyone, people are at greater risk of falling when they are older. Some of the reasons for an increased risk of falling are poorer balance, decreased muscle and bone strength, and diminished hearing and/or vision. That being said, falls also frequently result from an unsafe condition in the home, often in combination with the forenamed physiological risk factors. Knowledge of the risk factors that increase the likelihood of falling can help us to avoid falling in the future, particularly as we age and are at increased risk. One very important way to prevent falls is to stay as fit as possible, through regular exercise and healthy eating. In terms of exercise, it’s extremely valuable to engage in physical activity every day, such as walking to maintain balance, and also incorporate some form of weight resistance activity to maintain bone and muscle strength. Healthy eating involves eating lots of vegetables and fruits, and never skipping meals (as this can result in dizziness or feeling faint). Another important step is to have regular checkups for your hearing and vision. Finally, if you are taking medications, be cognizant of other medications with which they should not be combined, possible side effects (such as dizziness, stomach upset), and whether your medications should be combined with alcohol. Also important is to adjust your home environment and the types of activities in which you indulge, with safety in mind. Falls for people of any age often result when we’re wearing inappropriate footwear. It’s particularly important for seniors to wear shoes, slippers and outdoor footwear that provide good support, and for outdoors, have good tread and anti-slip soles. A walking stick or cane may also be very helpful in preventing falls, both indoors and outside. If you have prescription glasses or a hearing aid, always wear them. By eliminating hazards around the home, maintaining a health lifestyle, and reviewing medications, falls resulting in injury can be prevented, in many cases. Unfortunately, sometimes environments outside our home can be the source of a slip and fall accident, such as poorly lit walkways, spills that are not cleaned up, and poorly maintained sidewalks. And, if someone is injured on an unsafe condition caused by likely negligence of a property owner, including a municipality, you may be eligible to claim damages for injuries resulting from a fall. 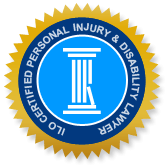 Accordingly, if you were injured in a fall and would like to determine whether you have a good legal case to make a claim, call a well respected and experienced Injury Lawyers of Ontario accident lawyer in your community. The experienced slip and fall accident lawyers in Kitchener and Waterloo have helped many clients, including senior Canadians, obtain owed compensation when they became injured due to an unsafe condition. Call us today to arrange a free no-obligation consultation and find out how we can help.